See T.Rextasy live in Glasgow this February 2017, voted as the UK’s number one live tribute band by a BBC1 ‘Battle of the Fantasy Bands’. Marc Bolan, with his band T.Rex, was one of the most flamboyant and charismatic stars of the original glam rock era. T.Rextasy have now been performing around the world for over 20 years, a career that ironically out lives Marc’s very own T.Rex. With Bolan’s special ingredient of Rock-a-Boogie songs throughout the 1970s including ‘Telegram Sam’ and ‘Jeepster’ he was able to obtain what would be yet another Top 20 record in 1976 that has since become one of the most memorable and everlasting signature tunes, ‘I Love to Boogie’. 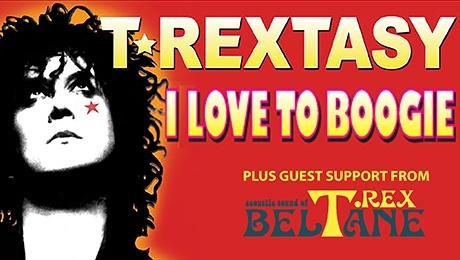 The band is now accepted as the world’s only official live tribute band dedicated to Marc Bolan & T.Rex, and the only band endorsed and approved by Marc Bolan’s family, estate, original ex-members of T.Rex, and Bolan’s catalogue management. The band has been described by many as ‘beyond the boundaries of tribute’.